“Somewhere in my youth or childhood, I must have done something good.” That’s a line from The Sound of Music, but it rings true for me. 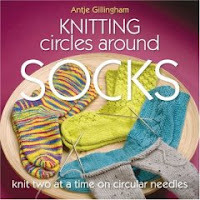 I certainly haven’t done anything to merit the knitterly goodness that continues to come my way. Today’s dose of incredibleness came from Criquette of beautiful Kansas. I must admit, prior to this afternoon, Kansas wasn’t one of the states I longed to visit, but she’s a great tour guide, and now, I’m thinking I need to fly out to visit my favorite cousin (in Iowa) and see some of what I’ve always lumped together as the “bread basket” of our country. Each item was wrapped in a lovely green and tied with a midnight blue ribbon. Heck, Criquette even explained why she’d chosen those colors to represent the blues and greens of her beloved prairie, since she knew me well enough to know I wouldn’t have been excited about yellow. Details! Each and every detail was well-executed and made her thoughtfulness ooze out of the box and into my living room. Evidently, the South has no monopoly on good hostesses; I think the folks in Kansas go out of their way to make a girl (and her dogs) feel welcome and eager to see more too! While I’d love to take you through each item, reading the “travelogue” on her blog will give you the same feel, minus the gifts, which are all mine. Well, um, not ALL mine; the dogs do get their treats, even though Criquette assures me they’re made with human-quality ingredients. There’s a local tea in three varieties, chocolate coated sunflower seeds, more chocolate (hmmm… maybe the Midwest is more aptly called the Snack Wagon? ), a hand-knit scrubby with handmade soap inside, luscious yarn, and of course, The Wizard of Oz items. Hush, Anne. I don’t know if any of my other regular readers know why the Wizard of Oz is so ironic for me, but that’s what friends are for. Let it suffice to say that I have a connection, and I appreciate it so very much, especially the funny notepad, which you really should click on and read. Mugsy would never desert me like that, nor has he ever chewed on shoes. Fred did have a right shoe fetish as a young pup, but he only carted them to his crate and held them in his mouth. The vet says it was because they smelled like me. Hrmph. Still, it’s a very cute pad, and I like it very much. I had to stop petting the yarn to type, but I am fascinated by the yarn (available here), and the chocolate coated sunflower seeds, which match. Who knew?! (So long, dark chocolate peanut M&Ms. There’s a new crunch in town.) Evidently, the prairie is a fascinating location, full of all kinds of goodness and wonder. Maybe you should check it out on your next vacation. It’s certainly on my radar now, as is the most awesome Criquette! Once more, a million thanks for a great Virtual Vacation, which arrived on an afternoon when I sorely needed it. Trying to get an action shot of a Jack Russell running wide open isn’t easy. However, it was past time for Mugsy to get a turn as the Dogs on Thursday star, so deal with my sub-par skills and know that he’s a happy boy. (Yeah, the Knight needs to cut the grass too, but it seems that when we’re not having a storm, we’re not home, or he’s exhausted. This weekend…) We go through tennis balls like you wouldn’t believe. Mugsy NEEDS one in every room of the house, and often falls asleep with a ball in his mouth. When he was younger, it was cute and funny. Now, I worry the old man might meet an early demise, so we try to talk him into dropping it nearby. Also, Amy still has a spot or two on her Pay it Forward list. I’m looking forward to knitting a surprise for her, and for Wendy and Nichole. More motivation to keep my swapping in check, so I can “spoil” my friends as they so richly deserve. My skinny, short sock has a home! The always kind Amanda will finally have her own pair of hand-knitted socks. I am honored to make them for her, and I’m delighted that the pretty pattern and colorway will have a happy home. The colorway isn’t that blue, but evidently, you can’t have accurate color AND a decent shot of the pattern. Go figure. It’s from Learn to Knit Socks, Little Pinky. Fun, easy to memorize pattern, in an ankle length. I think it would look great on one of my skinny-legged friends. So, no frogging. 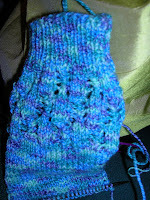 Can’t do it, but I am moving on so I can knit two socks at the same time. I also want to do the toe-up thing, especially since Surviving sent me the cool You Tube link to the Magic Cast On and more. So many socks, so little time! PS – My Pay it Forward list is full, but I hope you’ll find someone whose isn’t! I’m actually more of a “practice random acts of kindness” person, but I think they’re two sides of the same coin. At any rate, I look forward to creating some unexpected gifts for three of you, and watching the circle grow. It’s hard not to hold a very newborn baby and fall in love. Everything seems right with the world when you watch first-time new parents gush and coo, and share their precious gift and their joy with their family and friends. Thank you PoG (Parents of Grace) for bringing a little more beauty, joy, hope and love into the world. Pass those favorite baby girl patterns this way, will you? So, if you pop over to Schrodinger’s for the contest, tell her Chan sent you, would ya?